Through January 6, use the coupon code spellstone for 50 percent off on our entire line of Spellstone ornate combs, barrettes, loc ties, and hair sticks. All our Spellstone items are original designs by Alex Morgan and hand-crafted exclusively for Mehandi.com from domestic water buffalo horn. Spellstone combs and hair ornaments make great holiday gifts. Christian women in the medieval world of Spain, Sicily, Egypt, North Africa, and the Levant wore henna, and felt it was suitable adornment for the celebration of Christmas. 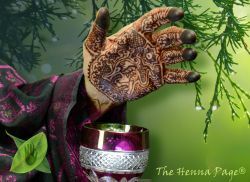 Islamic culture, with its advanced understanding of science, mathematics, medicine and literature, including women’s use of henna, was part of a prosperous and enlightened culture in southern Europe after the fall of the Roman Empire and before the Crusades. Ancient Sunrise Blog: "Twelve Ways to Prevent Hair Damage"
Human hair is a complex thing. Each strand consists of several layers which contribute to the structure, shape, and color of the hair. The outer layers are made of several tiny keratin scales (cuticles), which overlap like shingles. The core (cortex) of the hair strand consists of bundles of long, thin cells that contain melanin, the hair’s natural pigments. The hair also contains lipids, or fats, which balance moisture. Additional lipids are deposited onto the surface of the hair via the scalp’s sebaceous glands. If you are either a person who is interested in using henna for body art, or if you are someone who wishes to get henna done, it is crucial to be familiar with what is considered real, natural, and safe henna, and what is not. Sadly, there are too many products on the market which claim to be henna (but they are not), and which can be dangerous to the skin. Knowing the difference will keep you and/or your clients safe. This article will describe the differences, and explain how to tell these products apart.